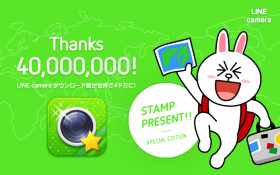 Line Corporation has announced today that that its photo decoration and effects app Line Camera has surpassed the 40 million downloads mark. That’s a pretty significant accomplishment, although one wonders how many of those 40 million have stuck with the app given the abundance of alternatives available in Line’s home market of Japan . 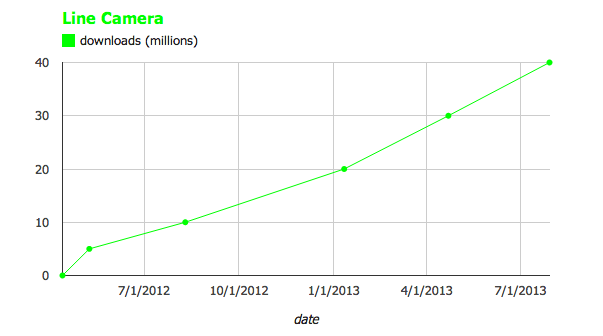 I was curious to look at the pace of Line Camera’s growth, given that I hadn’t checked in on the app in over a year (see chart below). After its initial launch in April of 2012, the app picked up 5 million downloads in its first month, and went on to snag 20 million just after New Years. With 40 million announced today, it’s likely that Line Camera’s growth will continue to be completely dependent on how fast the Line chat platform – which is how it is distributed – can grow. Still, there are lots of photo apps that didn’t have such an effective distribution platform as Line, most notably services like Papelook (said to have been downloaded by half of Japan’s young girls who own iPhones), or FX Camera, which had 25 million users as of this past March. For more information on the growth of Line and its vast repertoire of apps, including Line Play, please check out our interactive Line Timeline which chronicles its growth from its launch back in 2011 up until the present day.